Not long ago, I was involved in an IR engagement where an intruder had exploited a web-based application on a Windows 2003 system, created a local user account, accessed the system via Terminal Services using that account, run tools, and then deleted the account that they'd created before continuing on using accounts and stolen credentials. The first data I got to look at was the Event Logs from the system; using evtparse, I created a mini-timeline and got a pretty decent look at what had occurred on the system. 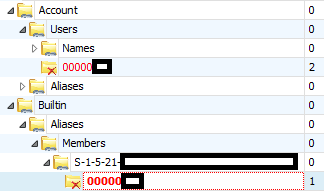 The client had enabled process tracking so I could see the Security/592 and ../593 events, but unfortunately, the additional Registry value had not been created, so we weren't getting full command lines in the event records. From the mini-timeline, I could "see" the intruder creating the account, using it, and then deleting it, all based on the event record source/ID pairs. 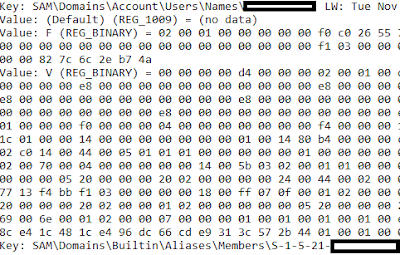 Once I was able to access an image of the system, a visual review of the file system (via FTK Imager) confirmed that the user profile was not visible within the active file system. 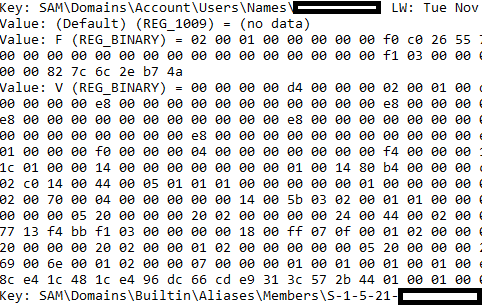 Knowing that the account had been a local account, I extracted the SAM Registry hive, and ran regslack.exe against it...and could clearly see two keys (username and RID, respectively), and two values (the "F" and "V" values) that had been deleted and were currently "residing" within unallocated space in the hive file. What was interesting was that the values still included their complete binary data. I was also able to see one of the deleted keys via RegistryExplorer. Not that I needed to confirm it, but I also ran the RegRipper del.pl plugin against the hive and ended up finding indications of two other deleted keys, in addition to the previously-observed information. Not only that, but the plugin retrieves the full value data for the deleted values; as such, I was able to copy (via Notepad++) code for parsing the "F" and "V" value data out of the samparse.pl plugin and paste it into the del.pl plugin for temporary use, so that the binary data is parsed into something intelligible. The del_tln.pl plugin (output below) made it relatively simple to add the deleted key information to a timeline, so that additional context would be visible. If nothing else, this really illustrates one of the valuable aspects of open source software. With relatively little effort and time, I was able to incorporate findings directly into my analysis, adding context and clarity to that analysis. I've modified Perl and Python scripts to meet my own needs, and this is just another example of being able to make quick and easy changes to the available tools in order to meet immediate analysis needs. Speaking of which, I've gone back and picked up something of a side project that I'd started a bit ago, based on a recent suggestion from a good friend. As I've started to dig into it a bit more, I've run into some challenges, particularly when it comes to "seeing" the data, and translating it into something readable. Where I started with a hex editor and highlighting a DWORD value at a time, I've ended up writing and cobbling together bits of (open source) code to help me with this task. At first glance, it's like having a bunch of spare parts laying out on a workbench, but closer inspection reveals that it's all basically the same stuff, just being used in different ways. What started a number of years ago with the header files from Peter Nordahl's ntchpwd utility became the first Registry parsing code that I wrote, which I'm still using to this day. When a new version of Windows comes out, everyone wants to know what the new 'thing' is...what's the latest and greatest artifact? But what about the stuff that always works? What about the old stuff that gets used again and again, because it works? Understanding the artifact cluster associated with certain actions on the various versions of Windows can help in recognizing those actions when you don't have all of the artifacts available. Using just the event record source/ID pairs, we could see the creation and deletion of the user account, even if we didn't have process information to confirm it for us. In addition, the account deletion occurred through a GUI tool (mmc.exe running compmgmt.msc) and all the process creation information would show us is that the tool was run, not which buttons were pushed. Even without the Event Log record metadata, we still had the information we extracted from unallocated space within the SAM hive file. Having access to open source tools means that things can be tweaked and modified to suit your needs. Don't program? No problem. Know someone who does? Are you willing to ask for help? No one person can know everything, and sometimes it's helpful to go to someone and get a fresh point of view.